Lake Marmo Winter Tree Watercolor Sketch – Let's Paint Nature! An inviting bench next to a lonely tree…I accept. Now that winter has stripped the leaves clean it’s time to really study the character and structure of trees. What makes them different from one another? What makes them unique? What flaws do they have? How does the color of the bark differ from its neighbor? What side is the sun hitting and how does the shadow cast? What color is the shadow? Is it windy? Are the shadows dancing? I love winter for the fact that the trees are exposed. When the snow falls ever so gently on each branch, they are dressed in their winter garments like a fancy white laced dress you only wear on special occasions. And every one of them looks different! I can’t wait for some snow. Take some time to study the trees. They’ll reveal themselves to you. You are so poetic in everything — your prose, as well as your art. Love the tree! 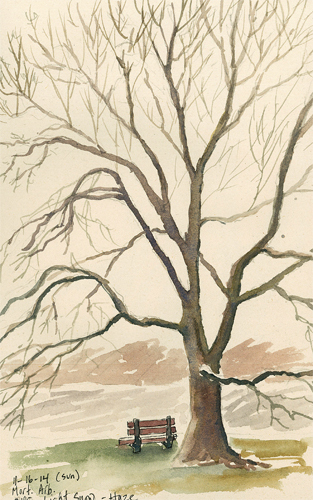 Especially the way the branches toward the top are of a lighter shade to suggest a further distance from the viewer. Good job! Thank you Larry, your words are so kind! Been following your blog for some time and I think I finally have the courage to follow some of your tutorials and make a painting of my own. I need something nice to hang up in my apartment. What type of paints do you use? I have zero art supplies so any advice would be great! You can do it Andrew!!!! Ok, as far as watercolors: I use Winsor & Newton and Grumbacher watercolor tube paints. As a beginner, you might want to try going to an art supply store and buying a student grade kit. Student grade is less expensive and you wont break the bank trying to see if you like watercolors. Here is one: Grumbacher Academy Student Watercolor Set. About $25. Has 10 colors. The brush that comes with it will be cheap and lose its hairs. Buy a good brush assortment kit for watercolors. Then you’ll need paper. 140lb cold press watercolor paper works great. About half the demo’s are pastel paintings. I use Rhembrandt soft pastels for the majority of the painting underneath, then I highlight with Unison soft pastels. Harder pastels go on bottom and softer pastels go on top when you layer. Look for kits, they will save you money, although Unison’s are kind of pricey. You will also need pastel paper. Don’t buy regular cheap pastel paper. You will not be able to layer. Buy pastel paper that feels like sand paper. That works best. You’re going to have sooooo much fun! Remember…don’t critique your work prematurely. Don’t give up either. Keep on creating!! Thanks Mark! Me too…I love November. Perhaps it’s the calm before the storm of holiday crazy shoppers?? I have a hard time loving nature in December when there’s so much going on! Awesome! Thanks for the tip! Will be sure to check out and follow your tutorials and follow up with my results! Hi, again, Christine. I hope this comment isn’t out of place here, but it relates to your response to Andrew. I normally paint with acrylics on canvas, but sometimes paint with acrylics diluted with water on Strathmore watercolor paper, cold press, 140 lb., a nice thick, sturdy paper. I think that since the pigments are being absorbed into the paper that I don’t have to worry about paint-film instability as I would if I used over-diluted-with-water acrylic on canvas. With my approach, I’m able to add successive layers of color in thin glazes when the paint is dry – different colors over top of colors, etc. And I can remove layers after the paint is dry by gently erasing with a plastic eraser, even down to the pure white of the paper. The Strathmore paper is tough, and it’s surface doesn’t tear, if I don’t overdo the erasing. Using acrylic washes this way is so much cheaper than using watercolors. As a final step, to tie everything together, I add a couple of coats of acrylic matte medium, which dries transparently. Would you care to give your critique of my approach, saying whether or not this type of approach results in a painting that is just as archival as a watercolor painting. Because permanence, non-fading, etc. are my biggest concerns. (I use only top-notch, non-fading, permanent acrylics, by the way.) Thanks in advance, Christine, for your help and your expertise. Hi Larry! Thanks for the detailed approach on painting with acrylics on watercolor paper. I do not paint with acrylics, therefor I do not have expertise in this subject, however what I was able to look up confirms that acrylic on cold press 140lb is not only cheaper but an acceptable way to paint. I do not think you have to worry about fading, if the paints you use are not student grade. There is no right or wrong and you do not have to prep the paper it seems. This would be a great alternative for Andrew if he is interested in acrylic painting, thinning them to preform like watercolors and not spend a lot of money. Thanks for the awesome tip, Larry!!! Thanks for your feedback, Christine. I have more confidence in my approach now. That was a great link, with more information on this subject than I have seen before. Thanks again. I really appreciate your helpfulness!